Bio- Water Cress - Restores health to damaged hair. Strengthens hair follicles, encourages hair growth, shiny hair, provides hair protection. Watercress is considered one of the great medicinal plants since Hippocrates first prescribed it. This nourishing formula is blended with pure watercress and extracts of pineapple, tomato, carrot, aloe vera, cucumber and lemon, to silken and strengthen hair for healthy-looking body and shine. Keeps color and perm in place. 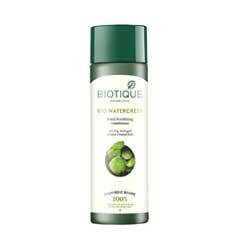 Protects hair against environmental dryness and damage. Apply liberally to wet, cleansed hair and masage in gently. leave on for one minute. Rinse well with water. Organically Pure & Preservative Free.No Animal Testing.